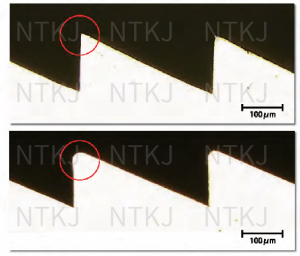 NTKJ Co., Ltd. creates high-quality, high-precision lightweight plastic lenses featuring a thin and efficient structure. We produce plastic optical products of practically any size, including Fresnel, lenticular, sheet prism, linear Fresnel, fly’s-eye and aspheric lenses. We also produce diffraction grating, optical roll molds, free-form surface lenses and elliptical lenses, spheric and aspheric lenses, UV and IR lenses, and light-guide plates. NTKJ has the manufacturing expertise and equipment to accommodate a broad range of customer needs, from prototype development to mass production. We pride ourselves on our high accuracy production line, beginning from optical design and mold creation, to finished products and coating. 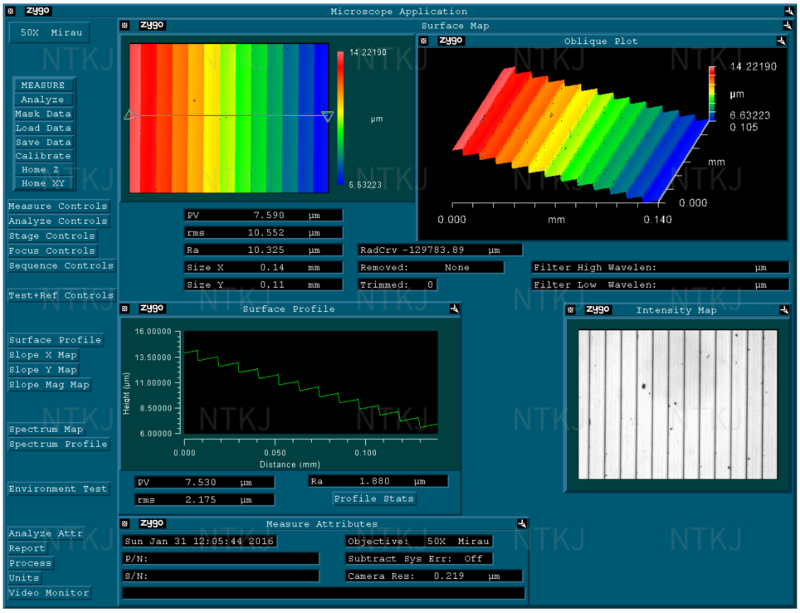 NTKJ’s engineers are ready and able to help you find or create the ideal product. Our facilities can accommodate a variety of materials and thicknesses. For prototype production or mass production of sheet molding, do not hesitate to consult with our team. We are ready and eager to manufacture lenses of any type to conform to your individual specifications. NTKJ boasts world-class level ultra-precise mold manufacturing. 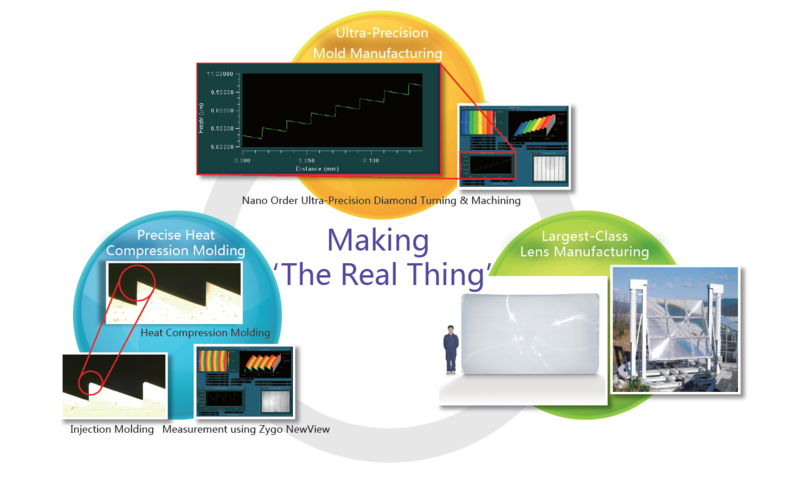 Using our nano order single point diamond turning (SPDT) and machining, we are capable of creating products with a resolution as low as 0.01 nanometer. We welcome requests for custom molds. NTKJ’s high precision molding technology is used to transfer fine optical patterns to various plastic materials, such as PMMA or PC. Compared with conventional injection molding, our precise heat compression molding can create lenses that are larger, thinner, and have more precise detail. Specifically, the radius of our lens peaks can be configured to be as low as 1 micron in size. We are able to obtain a mold-to-lens pattern transfer rate nearing 100%. As the sketch on the left describes, we are able to nearly precisely replicate the designed height (Hd) of the lens peaks through heat-compression (Hp), standing in contrast to the rounded lens peaks created by injection molding (Hi). Our precise heat-compression minimizes the amount of light lost as it passes through the lens. For the best possible results, our heat compression molding is the clear choice. Our large size lenses retain the same level of quality and precision that can be expected from standard-sized lenses. We produce massive lenses that are unrivaled in quality and size. For lenses larger than about 1600x1200mm, the direct cut method is used to create super-large lenses. The direct cut method lens grooves being directly cut into the lens material. The direct cut method, besides being used for super-large lenses, is also ideal for one-off custom lenses or prototyping. Making ‘the real thing’ since 1974. Nihon Tokushu Kogaku Jushi Co., Ltd. started business in 1974 as a corporate entity manufacturing and selling high-quality, high-precision plastic lenses. Today, we are known around Japan and internationally as a top producer of lenses. 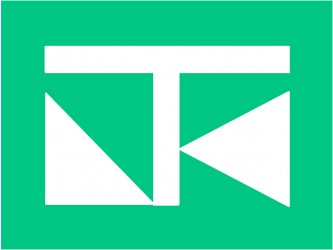 NTKJ’s headquarters are based in Itabashi, Tokyo, known as the optics capital of Japan. Relying on technological expertise and manufacturing know-how gained through decades of experience, we spare no effort in the discovery and application of ingenious ideas when developing and creating microscopic machined items. The satisfaction of our many customers, both domestically and abroad, magnifies our confidence in providing ideal solutions to your most demanding problems. Our uniquely designed lens machining equipment can craft lenses to microscopic tolerances, satisfying diverse requests and stringent specifications. We also manufacture customized machining equipment for mass production. The facilities at our factory are constantly being updated and expanded to include the most cutting-edge technology. We firmly believe that our distinctive capacity to produce a wide range of high-quality plastic lenses in various sizes in a timely manner will contribute to further research and development, and to the successful commercialization of your products. Please contact our experienced and knowledgeable staff for a consultation or quotation. Recently, flat prisms with finely ruled light guide panels are widely used in LCD backlight panels, and Fresnel lenses are increasingly employed for magnification or collector lens applications. Customized waveguides are also used for AR/VR/MR applications. Large-scale transmission and reflective screens, with dimensions up to 200 inches, depend on our sophisticated Fresnel or lenticular lenses for their superior performance. NTKJ Co., Ltd. manufactures and sells custom-made plastic lens products. Our machining systems are ready to produce plastic optical products of practically any size, including Fresnel, lenticular, linear Fresnel, fly’s-eye and aspheric lenses and flat prisms. Our manufacturing expertise and equipment can accommodate a broad range of customer needs, from prototype development to mass production. Our uniquely designed lens machining equipment can craft lenses to microscopic tolerances, satisfying diverse requests and stringent specifications. We also manufacture customized machining equipment for mass production. Contact us to discuss the possibility of your ideal custom product.